The first project is to construct a bow form. Bow forms are usually made from appropriate sized pieces of plywood, laminated together to the correct thickness. Longbow forms are usually 1 1/2" thick and recurve forms are 1 3/4" or 2" thick. To achieve the longbow thickness, 2 pieces of 3/4" plywood glued together will get the desired results. The correct thickness for 1 3/4" recurve forms can be obtained with 2 - 3/4" pieces of plywood with 2 pieces of 1/8" masonite sandwiched between them. Sandwiching a 1/2" piece of plywood along with a piece of masonite is what is needed to make the 2" form. The following are approximate dimensions for longbow and recurve forms. 68" and shorter longbows: 72" x 14" x 1 1/2"
After the bow form blank is finished, the next step is to transfer your bow design to the side of the blank and then carefully cut it out using a bandsaw. One technique that works well is to make your bow form blank in two equal pieces. Stack the two halves together, solidly holding them together with wooded plates along the edges. (See photo) Transfer half of your bow pattern to the connected plywood blanks and cut out both halves of the form at the same time. The halves are then butted together to complete the finished form. Using this technique, both the upper and lower limbs are cut exactly the same. The junction of the halves are strengthened using metal plates and angle iron. Straight longbow form: This form has an interchangeable riser section, which allows different riser configurations to be used. 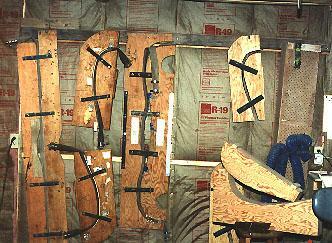 Takedown recurve forms: These forms were cut out simultaneously, using the previously mentioned technique, to insure limb uniformity. One piece recurve form: Both halves of the this form were also cut out at one time and then butted together to create the full length form. Note the metal plates and angle iron used to strengthen the form. Both sides of the form are plated. The upper right form is a youth takedown recurve form. The lower right form sitting on the stool is two take-down recurve blanks temporarily laminated together and cut out. (Note the wood block on the edges.) They will eventually be seperated and made into forms that are exactly the same. Its important that the form is square to its sides along its full length. Any place where it is out of square will result in limb twist. Simply by using a tri-square and checking the form, these areas can be trued up by careful sanding and filing. I usually cover the profile of the bottom form with a thin strip of rubber to help even out the pressure applied when the air hose is inflated. The following is a list of places where most of the necessary supplies for bowbuilding can be purchased. They handle complete bow kits, plus sell all of the hardware necessary to complete a form, including the firehose and end plugs. Also available are glues, fiberglass and laminations. The only disadvantage to their lams is that they sell exclusively actionwood and the only tapers available are .002" per inch. Riser wood selection is also limited. Mike, I believe, sells everything that's needed. Neil handles custom laminations ground to a variety of tapers, plus exotic riserwoods. His turn around time is excellent. There are other sources available. Traditional Bowhunter magazine usually has several listed in their ads or classifieds. Next installment we'll look at heat box construction and wiring.